These Scalextric spares white LEDs are excellent as Scalextric car headlamps. They emit a white light similar to the modern Xenon headlamps. With a suitable power connection to the car these 5mm 12 Volt LEDs are ideal to replace the small screw bulbs used for the car applications. Simply solder the wires to the motor and secure the LEDs with a drop of glue. 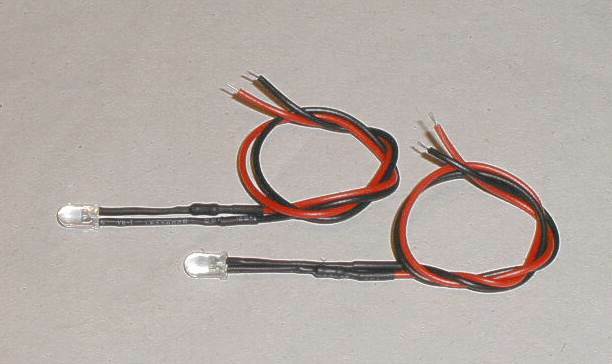 This Scalextric spares LED set contains 2 white 5mm 12 Volt LEDs. If you are not sure if these Scalextric spares LEDs are for your classic Scalextric car then please contact us we can help you.